How to Find the Best SPF Roofing Contractor! After looking at the different roof type options for months, you have finally decided on a spray foam roof and for good reason, they are seriously great roofs. But now the next hurdle awaits: How do you know that the roofing contractor you are about to hire for your Scottsdale SPF roof install is qualified and up to the job? You want to make sure your Scottsdale SPF roofing contractor is licensed in your state. Different states have different codes and your roofer should be aware and work according to your state's codes. It will greatly minimize chances of something going wrong. It is absolutely okay to ask to see the license and to verify that it is current. To prevent falling prey to scam roofers that disappear in the dark of the night, only hire a roofer who has a local address and phone number. Another reason to hire local is that in case anything should go wrong after the work is completed, you won't have any problems tracking down the roofing crew and holding your contractor accountable. Do you have workman's comp and general liability insurance? Why? Because one protects the workers on your property and the other (general liability) your property itself. Ideally nothing goes wrong, but what if it does. A responsible and experienced foam roofing company will have both. If they don't and they end up breaking windows or destroying your patio furniture you could get stuck with the cost. The same goes for the workers. If a worker falls of your roof during the spray foam installation and the contractor does not have worker's comp, you could be held liable for the medical bills. You really don't want that. Don't be shy asking to see the insurance certificates or calling the insurance company for verification. Will you remove and haul my old roof away? This should always be included. You are going to pay enough for your new Scottsdale Arizona spray foam roof, having to take care of removing your old roof and disposing of it, should not be part of it. Also ask where the refuse container will be placed to ensure yo still have access to your yard, car, garage and that nothing gets damaged in the process. You want a warranty that is as long as possible. 25 years is pretty common. A SPF contractor who is confident about his work, will always provide a great warranty. You don't want to discover a roof leak a year after you got your new roof and be responsible for repair costs already. Will you give me a written estimate and contract? Always get everything in writing. That way there won't be a chance for miscommunication and false claims. Written agreements will not only protect you, but the contractor as well and are in the best interest of all parties involved. Ask for someone you can ask question and resolve issues you may have during the installation process. Maybe you need a container moved, feel bothered by certain behaviors or just want to clarify something. There should always be someone available to answer your questions. As your local foam roofing and SPF specialist. 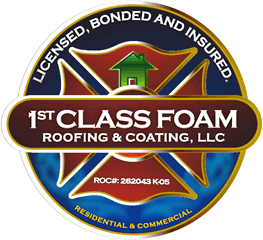 1st Class Foam Roofing always has their customer's satisfaction in mind. If you would like to know more about our spray foam and recoat services contact us today.